The long and on-going history of black freedom struggle should remain the contemporary focal point and forum of political demands for global justice. 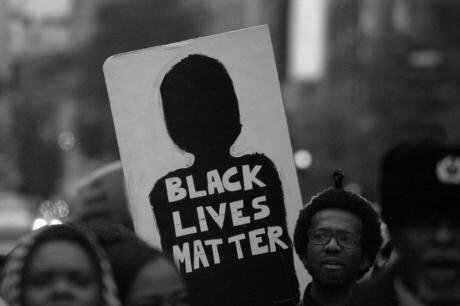 A 'black lives matter' protest in Washington DC in 2014. Cory Clark/Demotix. All Rights Reserved. Slavery has, of late, undergone a bifurcation in political and intellectual discourse. On one side, there are those who assert that thinking about possibilities for radical social change today are pre-empted by an undue focus on the history of racial slavery, the international abolitionist movement, and its post-emancipation cognates throughout the Atlantic world. They claim that the critical sensibilities and political energies of people of conscience have been absorbed by the centuries-long black freedom struggle against racial slavery. Framing our political efforts within this matrix, it is thought, eclipses equally pressing problems arising from distinct but related histories of capitalism, colonialism, and settler colonialism as well as the diverse movements arrayed against them. Within the professional milieu of the United States at least, entire fields of academic inquiry, journalism, policy-making, and service provision, and much community organizing and activism as well, have for a full generation advocated for an end to ‘the black-white binary’ analysis of race and racism. The call for paradigm shift has become the hallmark of the “post–civil rights era,” only more pronounced post-cold war and post-9/11, in which initiatives for racial justice, immigrant rights, indigenous sovereignty, liberal multiculturalism, and conservative colorblindness operate uneasily—often unwittingly—within a broad-based strategic integration. On the other side, there are those who assert that the progressive causes to which they have dedicated themselves are, in fact, extensions of the same black freedom struggle otherwise thought to have run its course in the mid-twentieth century and whose residual pride of place continues to obfuscate and distort movements for justice and equality in the present. Indeed, some of those urging us to move beyond “the black-white binary” employ key terms and concepts and not a little of the style, tone and timbre of black movements as they seek to decenter, subordinate, or supersede them. The ‘new abolitionists’ fighting ‘slavery’s global comeback’ a century and half after emancipation proclamations echoed throughout the hemisphere, are surely the most curious, and notorious, of the lot. The new abolitionists, including those working for the United Nations, the US State Department and human rights groups, are worried that interventionist approaches couched in terms of ‘human trafficking’ to ameliorate the condition of some thirty million people in question are euphemizing relations of force that amount to slavery here and now. For this cohort, the problem is not too much talk of slavery, but far too little. How to understand this contradictory regard for the history of racial slavery and black freedom struggle in the early twenty first century? We might begin by interrogating the stated or implied definition of racial slavery held in common by these various and sundry ‘post-black’ political phenomena. In each case, racial slavery is disavowed, which is to say that it is acknowledged and denied at once. It is acknowledged insofar as it is that historical experience most responsible for the African diaspora and definitive for African-derived people in the Americas and the Caribbean, given that racial blackness and modern slavery were, across the better part of a millennium, materially and symbolically soldered in the historic instance. It is denied insofar as it is thought that racial blackness and modern slavery, once soldered, can be and have been materially and symbolically separated without another epoch of catastrophic violence commensurate with their making. To wit: a global slave population in the current conjuncture whose “highest ratios...worldwide are from South and Southeast Asia, along with China, Russia, and the former satellite states of the Soviet Union,” according to J.J. Gould’s 2012 article in The Atlantic. Gould notes further: “Though now universally illegal, slavery still exists”. There’s the rub, but neither for the reasons the new abolitionists propose nor for those offered by most of the critics whom I join on this platform. For the former group, the problem of slavery’s illegality demands redoubled efforts at law enforcement and compliance monitoring throughout the global commodity supply chain, humanitarian aid and economic development projects in the poorest and most vulnerable regions of the world alongside ethical consumption practices and reformed immigration policies in the richest and most protected. Various critics in this forum have demonstrated amply that all such approaches mistake the symptoms for the cause, leaving intact the whole infrastructure of neoliberalism, which must systematically violate the letter and spirit of its own rule of law in order to continue its proper and lawful occupation. For the latter group, the rhetoric of contemporary slavery mystifies the genesis of ‘human trafficking’ and euphemizes relations of production that amount to exploitation here and now, while insisting we can and should resolve the problem by pursuing what political commentator Sally Kohn has called a “kinder, gentler capitalism”. The new abolitionists and their critics, despite acute debate about how to address extreme exploitation today, may nonetheless share a common misunderstanding of (racial) slavery and (black) freedom, past and present. I am taking a cue here from historian James Oakes, who argues in his recently reprinted study, Slavery and Freedom, that such misunderstanding involves a failure to distinguish sufficiently the economic and political domains. The result is a conflation of slavery with conditions of severe material deprivation, including the conditions requisite for life itself. Oakes, however, is careful to relate the economic question of material well-being to the political question of standing within a social order: “a slave was a slave, whether he lived a healthy hundred years or a sickly forty, whether she was better fed than a Polish peasant or more miserably housed than an American yeoman”. We might track the critique of the new abolitionism along three lines. First, a serious concern about addressing the legacy of slavery since emancipation and challenging how the metaphorical use of slavery to describe extreme exploitation does a disservice to the true source, scale, and nature of the problems that define our moment. Second, a deeper concern about the continuation of the political conditions of slavery despite the circumscribed emancipation enshrined in the thirteenth amendment to the US Constitution and similar legislation. Legal scholar Guyora Binder reminds us that emancipation, far from providing a remedy for slavery, is actually a component of its form and function. “The institution of slavery could persist without any individual being lawfully held as a slave” in the usual meaning of the term, writes Binder in his 1996 article for the Cardozo Law Review. Abolition, then, entails far more than universal manumission, something only indicated here as the generalization of the ex-slaves’ “freedom dreams” for a radical reconstruction of society. And third, paraphrasing critical race theorist Anthony Farley, a fundamental concern about “perfecting slavery” paradoxically through emancipation and the on-going struggle for black equality. This third concern differs from the now standard criticism of black movements that would reduce them to anti-racism, reduce anti-racism to demands upon the state, and reduce demands upon the state to statist politics. The caricature of black freedom struggle would like to paint its vast and varied activity into the corner of irrelevance; whether restricted to an admirable historic victory against a specific set of lamentable conditions in the nineteenth and twentieth centuries, or denigrated as an annoying fixation upon a specific set of conditions far less lamentable than those it blocks from sustained consideration. What this third concern suggests is that slavery is indeed a contemporary problem “all over the world”, but not the de-racialized colorblind slavery of the global comeback narrative. Racial slavery does not simply persist in attenuated form as a legacy or aftermath demanding continued vigilance. Neither does it persist in vacated form post-emancipation as a slavery without slaves. Those would be problems enough. Rather, it persists as a problem compounded by every effort to eliminate it while preserving the fabric of the very modern world it brought into being, not only its prevailing economic system. For adherents to the status quo, abolition is a four-letter word, a demand “too radical to be formulated in advance of its deeds”.